Kotobukiya Danger Room Sessions Psylocke lights up my display! 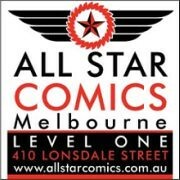 I can think of no better way than cheering myself up from last night’s Matty sadness than to review the piece that I am going to look at tonight. The Kotobukiya Danger Room Sessions Psylocke Statue is one of my favourite recent purchases, and I haven’t stopped marvelling at her every time I pass my my display. There have been a flurry of Psylocke statues in the last year or so, with Sideshow and Bowen both putting their FS efforts forward, and Koto has already released Psylocke in their Bishoujo line. The Sideshow and Bowen pieces were locks for me in terms of keeping collections complete, but the Bowen FS effort really isn’t a great piece in my view, so I was open to another version. I was slow to consider Kotobukiya’s work due to some concerns about detail and paint work on their early Marvel pieces, but after loving the Fall of the Hulks Set and great experiences with the Doctor Doom and Bucky Captain America Fine Art Statues, I’m over that hurdle. Thus, when I got a good look at this piece in a local shop, I knew I’d be happy with it if I found it at the right price, and shortly thereafter I did on the often useful bay of E.
There were two things that struck me right away about this statue. The first was the dynamic pose, and the second was the determined facial expression. There is so much happening in this pose - Psylocke’s right hand has an energy blast at the ready, while her sword is held in per left. She stands astride a Sentinel hand with her left left raised at the knee. All of this detail is very nicely sculpted. I particularly like that her arm and leg bands, sleeves and boots are sculpted on as opposed to just being painted. I love Bowen’s work, but some of the Marvel females that have been produced of late have been too blank in the facial expression department for me, and I always have been a face guy. Psylocke looks ready for battle and determined to win - and her facial expression makes the piece for me. I have read some complaints in reviews about the paint work on this piece, but I’m very happy the work on mine. Of the three statues recently released of this character (excluding the anime styled Bishojo piece) this one nails the colour choices for her outfit and hair the best. There’s also a nice sheen to her uniform which gives it a different textural feel and adds depth. As well as nailing the colour choices, the finer details on this piece have also been painted well. Painting eyes in correct alignment seems to be a dying art, but it’s been done well here, and all the details of her face are very nicely done - eyebrows, eyeliner, lips. I’m not sure what may have caused others to criticise the paint job on this piece, but I have no complaints. All of these positives are before we even get to the base of this statue. The Danger Room Sessions series is meant to link the X-Men through its bases, with Sentinels featuring in a few, and Psylocke has a plum piece. 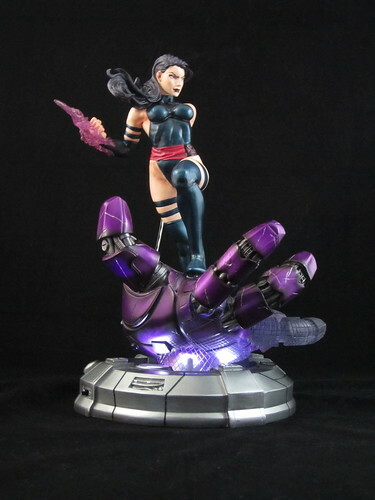 The upturned hand makes an excellent platform for Psylocke to stand on, and it has an amazing amount of detail. The visible joints and circuitry underneath the shiny plating is a great touch. This base also has a light-up feature for extra effect. The bottom of the hand and the lower two fingers are designed to be semi-translucent to make the light go further, so it’s more effective than the lights in the Doctor Doom base. It all makes for an excellent piece. I'm really not sure how I ended up owning so many different versions of Psylocke, seeing as she isn't one of my favourite characters. Regardless, I think this one is not only my favourite of the set, but one of my favourite pieces in my collection at present. Well done Kotobukiya! You can see more pics at Facebook, discuss this at the AFB Forum, and you can comment on this post to enter theJune AFB Comment of the Month Contest!